On the road to the iconic Mont- St.- Michel, the island monastery off the coast of Normandy , the traffic came to an abrupt halt while we were on a family trip a few years ago. We got out of our rental car as we saw others exiting the tour buses. To our surprise it was not a car accident, but a flock of muddy sheep strolling across the ridge of the causeway to the abundant grazing land on the far side. The moment that I saw the image in the camera, I knew that it was to be a future painting. I did a study for a more detailed watercolor on an 11x 15 sheet of Arches paper. I can see that the composition would be improved if I raise the horizon to the top third of the paper. Also, I plan to add more details to the foreground puddles of water. The water could also be improved by saving the lighter values for highlights. The color and the mist didn’t photograph well, but will also be strengthened. 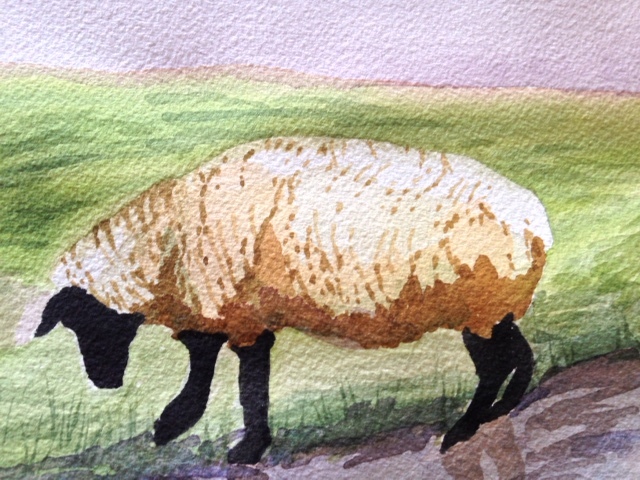 The sheep which are the main focus, could also be improved with attention to the details of the legs and facial features. 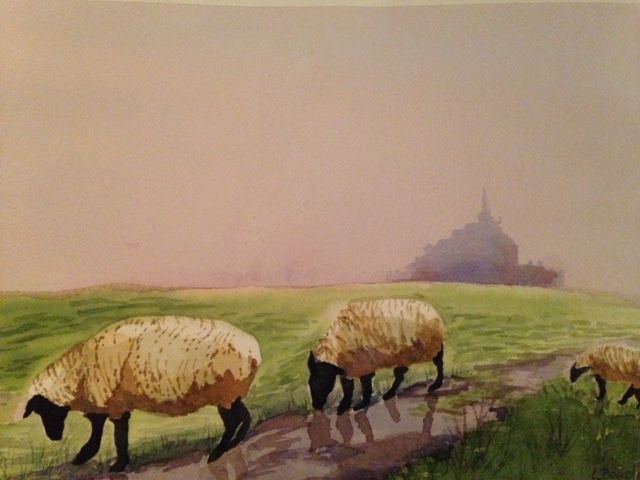 Additional sheep on the right will also be included in the final painting. Can you tell that I am fond of sheep? 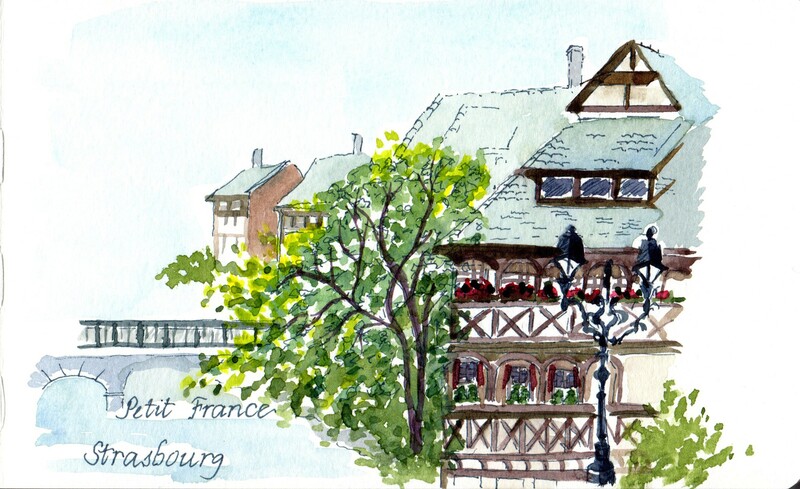 The next time that I was able to sketch was in Cologne, Germany. After touring the Cologne Cathedral we stopped for lunch at the Kolsch Brauhaus. Generally, I prefer a glass of wine to beer, but decided that I should sample the local speciality. Kolsch is an all barley pale ale which went well with my shrimp salad. I didn’t try the huge sausages that were served on huge wooden planks. My sketch is my view from the outdoor table of the ornate Rathaus framed by the awning and flanked by other buildings. Again, I sketched with my Micron pen and later added the watercolor. The intricate detail of the Rathaus was more than I could attempt during lunch. But, I think I was able to get the essence of the scene. 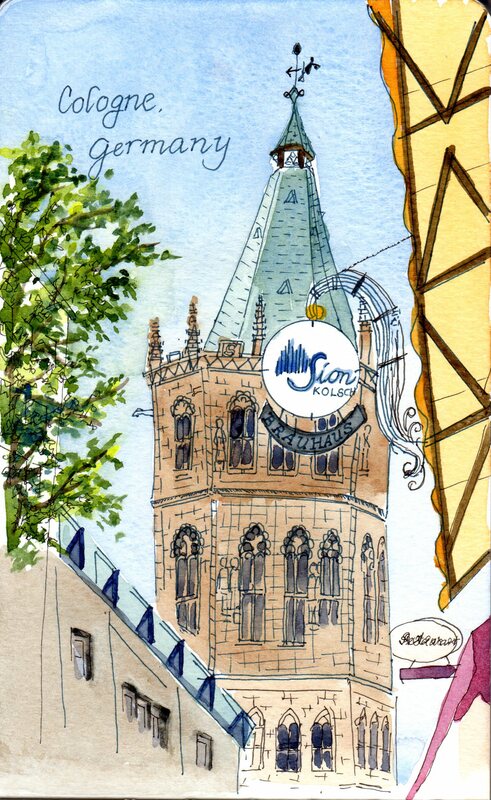 Here is the sketch from Cologne: Prost!